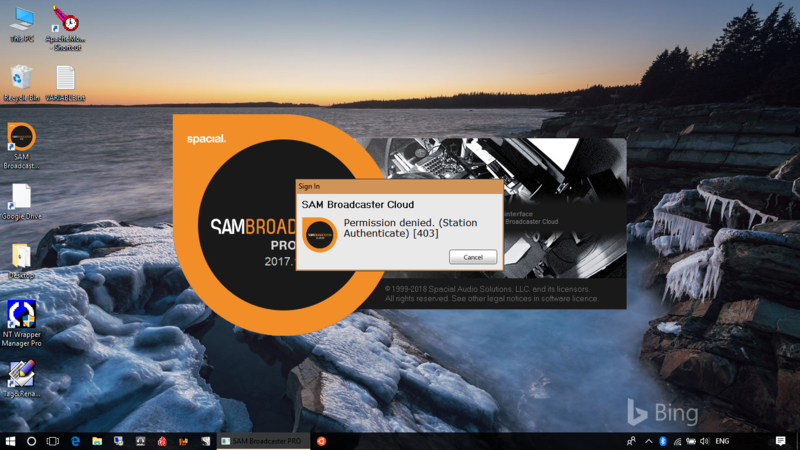 SAM Broadcaster Pro trying to login to Cloud. Post subject: SAM Broadcaster Pro trying to login to Cloud. I no longer have a subscription/login to the Cloud, but every time I start SAM Broadcaster Pro up, it halts as it's trying to login to the Cloud service, which I no longer have. I then have to click on [Cancel] in the popup to get past it. Can this behavior be stopped/fixed? Post subject: Re: SAM Broadcaster Pro trying to login to Cloud. SAM Cloud and SpacialNet are not really related. SAM Cloud (previously known as SAM Vibe) is the SaaS Broadcast automation system with included Stream hosting and file hosting for your audio files. Spacialnet is an independent Stream Hosting service run by Spacial. This one isn't connected to any software. You get bare bones Shoutcast server hosting here. Well, what ever this is, how do I stop it. Are you sure your credentials are blank in the Cloud log in in the SAM config? Have you checked to see if it is in the SAM.core.xml? There is no SAM.core.xml or SAMBC.core.xml in the SAM directory? Also, there is no Cloud login - only the button one presses to actually login. If its behind it, I can't see it? Ok, searched the HDD, found it, deleted the login/password, now it starts up without asking me to login. Thanks for the clue. SAMBC.core.xml in the AppData/SpacialAudio directory. All SAM config is stored in th "Data Path" as of 4.7 I think. If you can't remember the path, there's always a shortcut in the start menu and one in the tools menu of the software itself.